Home » Posts » Attentionology for K-5 Teachers » Add Something NEW to Your Classroom Discovery Place! Add Something NEW to Your Classroom Discovery Place! “On our way to Science Time, class, let’s stop by Discovery Place and find something NEW! Daily routines are mandatory for classroom management in any grade, but routines can become boring. Routines can dull students’ enthusiasm for learning. Pump a little excitement into a school day by adding something NEW to your Classroom Discovery Place! Draw attention to this special space by walking to it and showing off what’s NEW. It may be a poster of the solar system you just brought in – a perfect addition to Discovery Place as your class begins a science unit on the planets. Your Discovery Place doesn’t have to be fancy nor take a lot of time to set up. 1) Select and clear part of a table or one bookshelf or a chair to hold items that students can “discover” for fun and learning. 2) Choose items to put in your Discovery Place. Use what you have at hand, including items in your classroom that have gotten little use this term and items “hanging around” at home. 3) Write note cards with activities kids can do with items they find in Discovery Place. 4) Leave blank cards in a basket for kids to write their own activity plans in Discovery Place. 5) Make a Discovery Place poster to designate the area. 6) Catch kids’ attention by covering Discovery Place with a large piece of fabric before you introduce it to the class. Attach a Please Do Not Disturb sign to the fabric. Ask a student volunteer to help you remove the Please Do Not Disturb sign to reveal Discovery Place. Tell your class that you’ve created a special space to give the classroom a fresh feeling. Explain that you’ll be adding NEW items for students to discover as time goes by. Challenge them to be on the lookout for what’s NEW…empty tissue boxes, for example, ready for students to reuse. Invite students to bring in found objects, like pine cones or interesting rocks, to drop off in your Classroom Discovery Place. 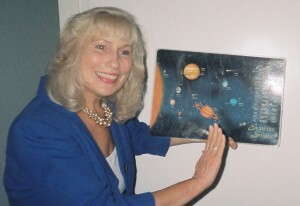 Demonstrate the way you hope students will use Discovery Place with connections to your curriculum. Stuff a small felt bag with slips or recycled paper on which you’ve written story starters in your Classroom Discovery Place. Art – Pick up a small shadow puppet made from scrap paper and a found stick or straw. 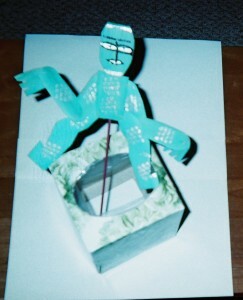 Stand the puppet up in a reused tissue box. 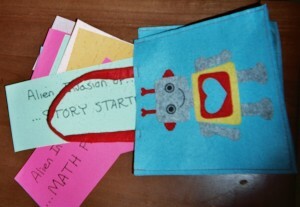 Writing – Pull a story starter card out of an old felt bag that you found in a closet. Hold the card up and suggest to the class that they can stop by Discovery Place to find good ideas for writing. Reading – Pick up an old book that you’ve put in your Discovery Place. Share the pleasure of tapping into one’s family history by bringing an old book to class – maybe one that you found hidden in an old box in the attic or a loved one’s home. Challenge students to find the oldest book in their own home…another discovery! Ask them to write down the title, author, publisher, year of publication, and if possible, borrow the book to bring to school. This book-based activity in Discovery Place is a great way to help third – fifth graders make a connection with history and social studies. found natural objects like feathers, pebbles, rocks, etc. The joy of learning is to know that when we take time to stop, look and listen to the world around us, we can make new discoveries every day. Doing so trains the brain to be alert, pay attention, and be open to what’s new – all important skills for the 21st century! Please send comments about special spaces that you’ve set up in your classroom. Stop back Wednesday for a new Mid-Week Focus. 4 Pings/Trackbacks for "Add Something NEW to Your Classroom Discovery Place!"